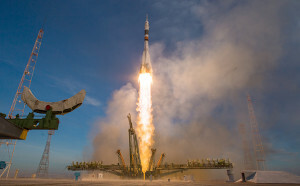 A Soyuz booster rocket launches the Soyuz MS-11 spacecraft from the Baikonur Cosmodrome in Kazakhstan on Monday, Dec. 3, 2018, Baikonur time, carrying Expedition 58 Soyuz Commander Oleg Kononenko of Roscosmos, Flight Engineer Anne McClain of NASA, and Flight Engineer David Saint-Jacques of the Canadian Space Agency (CSA) into orbit to begin their six and a half month mission on the International Space Station. The Soyuz carrying Anne McClain of NASA, David Saint-Jacques of the Canadian Space Agency, and Oleg Konenenko of Roscosmos launched at 6:31 a.m., EST, from the Baikonur Cosmodrome in Kazakhstan. 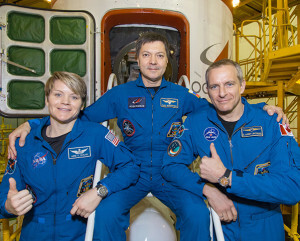 In the Integration Facility at the Baikonur Cosmodrome in Kazakhstan, Expedition 58 crew members Anne McClain of NASA (left), Oleg Kononenko of Roscosmos (center) and David Saint-Jacques of the Canadian Space Agency (right) pose for pictures Nov. 29 in front of the Soyuz MS-11 spacecraft during a final vehicle fit check. Follow McClain on her space mission at https://twitter.com/AstroAnnimal. 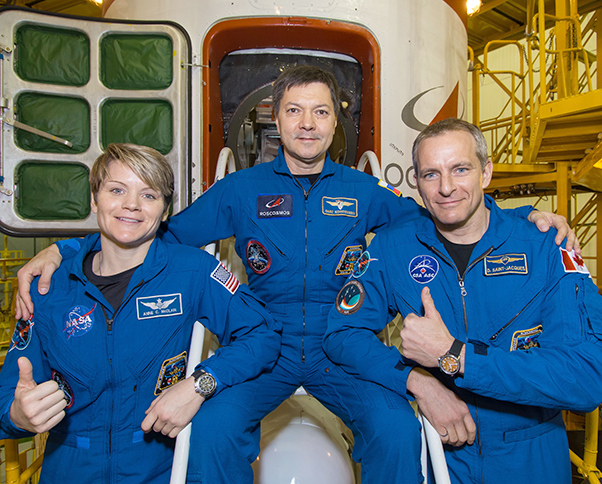 Get breaking news, images and features from the space station on social media at https://instagram.com/iss, https://www.facebook.com/ISS, https://www.twitter.com/Space_Station and https://www.twitter.com/ISS_Research.